Ideal for recreational or family play, the Control Spin Table Tennis Racket Set has everything you'll need for a fun game of table tennis. Ideal for recreational or family play, the Control Spin Table Tennis Racket Set has everything you'll need for a fun game of table tennis. The two hardbat-style table tennis rackets sport a rubber blade surface with ball control pips and hollow core performance handles. This set contains three 40-millimeter ping pong balls, 2 white and 1 gold. 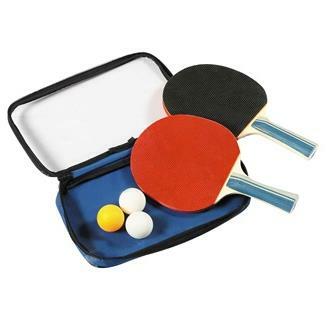 A vinyl zippered carrying case completes this handy table tennis accessory pack.